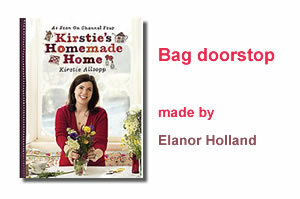 The following instructions to make your own doorstop are from the Kirstie’s Homemade Home Book and they can be also be used to make pretty scented bags! Step 1 – Cut out 2 pieces of fabric measuring 15×30 cm. Cut a 15 cm length of braid and pin it to one piece of the fabric, placing it equidistantly between the top and bottom. Stitch in place along its top and bottom edges. This is now the front of your doorstop. Step 2 – Fold over 2 cm at the top of both the front and back pieces, turning it to the wrong side of the fabric. Pin and press, then stitch in place, leaving the ends open. This forms the channel for the drawstring cord. Step 3 – Place the front and back pieces together, right sides facing (so the braid is facing inwards). Pin around the 2 sides and the bottom, taking a 1 cm seam. Step 4 – Stitch around these 3 slides, starting just below the channel at the top, down the side, across the bottom, and up the other side, again stopping just below the channel opening. Step 5 – Trim the bottom corners on the diagonal to reduce bulk, then turn right side out. Step 6 – Thread the cord through the channel. The easiest way to do this is to attach a safety pin to one end, then use this to feed the cord through the channel. Finale Step! Fill a strong plastic bag with sand and seal the top with sticky tape. Pop the sandbag inside the fabric cover. Pull up the drawstring cord and knot the ends together. What a lovely blog! 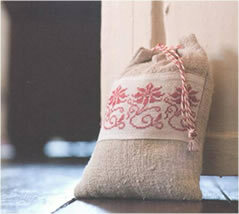 I’m researching doorstops for a 1/2 day sewing workshop I’m holding, I’ve found lots of inspiration here.